New film footage, photographs and interviews provide a rare insight into life in Sudan’s war-torn Blue Nile State: a contemporary, condoned Genocide. The people of Blue Nile State are enduring systematic and ruthless assaults on their lives and communities by their own government. 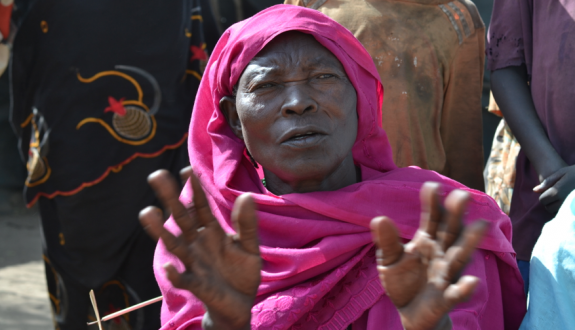 Since conflict broke out in 2011, the Government of Sudan (GoS) has regularly targeted civilians and civilian infrastructure with aerial bombardment by Antonov aircraft, ground assaults and missile attacks. Severe insecurity and a blockade on international humanitarian assistance make Blue Nile State particularly isolated, with foreign visitors extremely rare. The conflict is largely unreported, and local people feel that the world “continues to turn a blind eye” to their suffering. A delegation from the Humanitarian Aid Relief Trust (HART) has just returned from the region, after visiting a number of locations in Sudan and South Sudan, including Blue Nile State. Interviews and film footage capture the voices and testimonies of those living at the heart of this forgotten conflict. “The effect of the bombardment is so far-reaching, because it touches every aspect of life in these areas,” said HART’s partner Benjamin Barnaba. “The bombardment is so intense, it is everywhere, even in the bush where the cattle are kept. They are subsistence farmers and cattle keepers, but when they see the Antonov they go into hiding and don’t have time to till the land. They face starvation”. Meetings with victims, civil society representatives, community, religious and military leaders and health workers revealed the devastating effect on the physical, psychological and social wellbeing of the local population. Those who fled to South Sudan as refugees now find themselves trapped between two conflicts. Some are returning to Blue Nile State. They are forced to choose between aerial bombardment, isolation and possible starvation in their own land, or hunger and civil war in South Sudan. In the words of one refugee: “there is no safety anywhere”. “Antonovs come even at night while people are asleep” described one refugee in South Sudan, who had arrived the previous day from Blue Nile. “The planes use searchlights to see where the people are so they can see where to bomb us. Now we have to be careful about using any light, even fires for cooking. The Antonov comes quickly and bombs the area and people hide under trees or in streams”. On a previous occasion, we visited the Nuba Mountains in South Kordofan. Last Saturday, we met representatives from the region who described recent attacks. On Christmas Eve, two children were killed and four injured when a school in Buram County, South Kordofan, was bombed. On Christmas Day, Buram town was bombed, killing five people and injuring 21. In Kadugli County, also on Christmas Day, three children were killed in an attack on a school. “We have seen the evidence of a neglected genocide and a humanitarian catastrophe which bring political and moral imperatives for action by the international community” says HART CEO Baroness Cox. “There is an urgent need to break the culture of impunity which allows the Government of Sudan to continue its ruthless policy of the attempted elimination of the indigenous population of Blue Nile State”. Baroness Cox is available for interviews. Photographs and footage are available on request. A full report will be published shortly. For more information, or to arrange interviews, please contact caroline.cox@hart-uk.org and alice.robinson@hart-uk.org, or call +44 (0) 208 204 7336. The press release and executive summary can be downloaded below.